We believe ALL kids can learn! We will do WHATEVER IT TAKES! 1. Sign up on the Google Doc for a 15 minute time slot for RtI Checkout. 2. Upload second semester RtI logs to the RtI Aware Form. 3. Be sure that the goal sections are updated to reflect the most recent goals. **What kind of progress has the student made with the current RtI interventions? **Which strategies have been successful/not successful in promoting progress? **What recommendations do you have for next year for the student's intervention? 4. Print a copy of the RtI Aware Form for each Tier 2 and Tier 3 student and any Student Trackers that you have completed. I will collect these at the time of your appointment. 5. Plan to stop by April's office to complete end-of-year At Risk paperwork before or after your RtI Checkout session. Be sure to have a specific measurable goal for each tier 3 student. There are example goals in the MISD RtI Google Site. This goal should be below grade level. 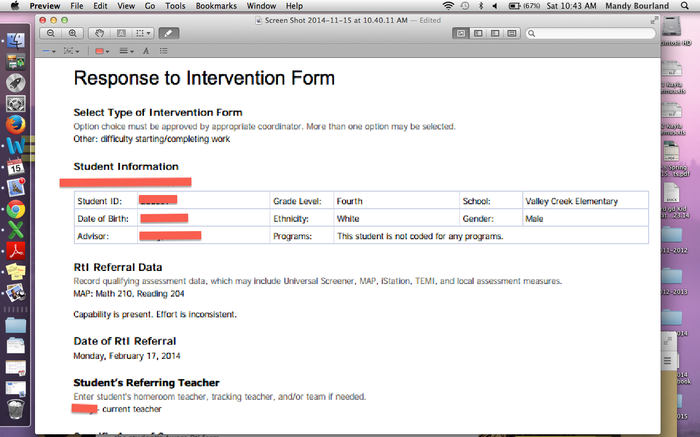 Be sure that it is noted on the progress monitoring log and in a SMARTgoal box in the student's Aware RtI form. You should use the initial assessment as the baseline which will be your first data point on the progress monitoring log. After this, progress monitoring occurs after every 90 minutes of intensive intervention (about once per week). 30 minutes of the required intervention can be on Istation or Think Through Math. 60 minutes should be delivered face-to-face with the teacher during small group instruction. Logs must have the SUBJECT and the SEASON in the titles. An annotated example is on the MISD RtI Google Site. 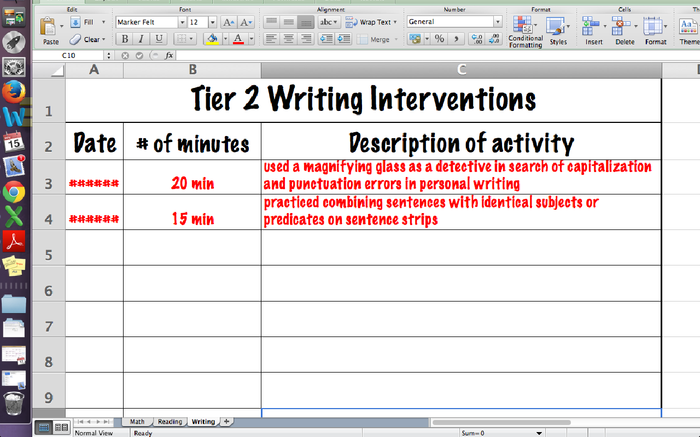 You may use any version for Tier 2 as long as it includes the date, duration, and description of the intervention. How do I fill out the Aware RtI Form? Be sure to update this form after Q1 conferences, Kid Chat, or other decision-making points for your students. 1) check the "Other" box and type "Tier 2"
2) In the Goal box, type "Tier 2 Interventions are appropriate"
5) be sure to update this form after Q1 conferences, Kid Chat, or other decision-making points for your students. How do I upload a log to the Aware RtI Form? 2) all available lines on the log are full and a second log is needed for the same goal. 3) Tier 2 logs documenting interventions through December 2014 should be uploaded. 4) Tier 3 logs noting focused interventions and weekly progress monitoring through December 2014 should be uploaded. 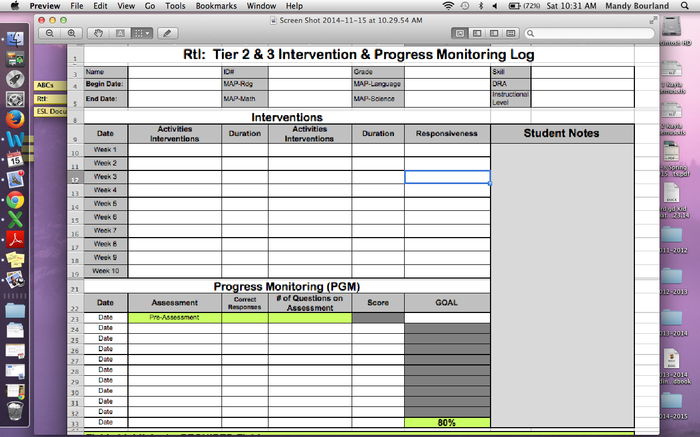 5) TEMI logs are appropriate for Tier 3 math progress monitoring. A log of interventions will need to be uploaded, but there is no need to transfer the information to a Tier 3 log when using a TEMI goal/log.